January 12, 2011, 1:01 PM · Many regular readers of Theme Park Insider are roller coaster veterans: folks who've learned how to ride even the scariest, fastest and most stomach-churning roller coasters without fear. This post is for the rest of us. If you really want to ride a roller coaster, there is a way to overcome your fear, concern or worry and do it. You don't have to spend part of your day at a theme park watching everyone else's bags and purses. You don't have to kill time in the shops or on a bench while the rest of your family and friends have fun. You can learn how to ride a roller coaster. And, even, to enjoy it. First, allow me to assure you that if you follow the park's safety rules, the odds are overwhelming that you won't get hurt riding a roller coaster. I've been tracking theme park accidents for more than a decade now, and know that millions of people ride roller coasters every year without incident. Now, I won't lie to you - some people get injured, or even die, on roller coasters. But of those who have died, almost every one of them either had a health problem that should have kept them from riding or did something colossally stupid that put themselves in grave risk. And even that number of incidents represents a tiny fraction of a fraction of the total number of roller coaster rides in this country. You're taking a far, far greater chance getting in a car to drive to the amusement park than you are by getting on a roller coaster. So if you're cool getting into an automobile, you ought to be okay with climbing into a roller coaster seat. Of course, riding a roller coaster doesn't feel like riding a car. (And if it does, you need to find a better driver - or a better roller coaster.) Let's acknowledge what happens to your body on a coaster. The dips, jumps, twists and speed will subject you to a variety of gravitational forces. Those forces are part of what make a coaster fun to fans: the pressure of a high-G turn, followed by the liberation of zero-G "air time" as the coaster crests a hill at high speed. Those forces are why parks prohibit people with certain health conditions from riding. If you are pregnant, or have any heart, neck or back problems, you're not supposed to ride, and you shouldn't. If you're overweight or out of shape, a park won't keep you from riding its coasters (assuming you'll fit in the seat), but I'll tell you from personal experience that you'll have a much better time on the coaster if you drop some pounds and get in shape. Why not consider an upcoming theme park trip as incentive? You'll not only feel better flying down a coaster track at 60 mph, you'll feel better every moment of your life. Comfort's important. If you're uncomfortable sitting in your seat in the coaster's loading station, you're gonna be uncomfortable out on the ride. Many parks now put a couple coaster seats at the queue entrance for their roller coasters, so visitors can sit down and give them a try before investing the time to wait for a ride. Different roller coasters have different seats, so don't assume that just because you were comfortable on one type of roller coaster, you'll feel fine on all others. Give the seats a try before getting in line. If the seat works for you, take a moment to find the "grab bar." This is a metal handle or pair of handles that you can hold while you're riding. I've found that many coaster newbies feel more secure when they've got their hands on the grab bar during the ride. If the coaster is one with "over the shoulder" restraints, you'll usually find the grab bars there, at about chest level, on either side of the restraint. If you're in a more traditional "mine car"-type coaster seat, you'll find the grab bar on the side or front of the car. Once you're comfortably seated with your hands, reassuringly, on the grab bar, be sure to keep your eyes open as you leave the station, and throughout the ride. Don't give in to the temptation to close your eyes. Your eyes tell your body what's coming next on the ride, allowing you to subconsciously adjust to every change on the track ahead. That's why coaster designers up the thrill factor on relatively tame coasters by building them inside and running them in the dark. If you can't see the track ahead, and your body can't prepare, that makes the ride feel wilder than it really is. You're trying to make the ride feel more manageable, not out-of-control. Keep those eyes open. Here's the best tip I can give a roller coaster rookie: If you're over 16 and have a driver's license, just pretend you're driving the coaster. As you go down the first hill, or launch out of the station, mash your right foot forward like you're pressing the gas pedal. If you feel like the coaster's going too fast, slam that accelerator harder. Gas it. Steer the thing with the grab bar. Put yourself in control. This is driver's ed. Just as you needed practice to learn how to drive a car well, you'll need practice to learn how to ride a roller coaster. Don't give up after one ride. Get back on that same coaster and try to drive it better this time. And again, until you feel like the IndyCar champion of that track. Then try other coasters. Be the world champion race car driver on one. The Air Force stunt pilot on another. Or, a broom-riding Quidditch player, too. The more your mind and imagination is actively engaged in the ride, the more comfortable and in control you will feel. Ultimately, if you get really good at this, you'll change to doing things to make yourself feel less in control, such as closing your eyes, or looking at something behind you on the track to divert your attention. (Google "goat trick" for an example.) Whatever you do, though, never break a park's safety rules. They are there to protect you. I hope that this encourages a few folks with roller coaster phobia to give one a try. For the rest of you, the roller coaster pros, why not help your fellow readers by offering a few tips of your own, in the comments? January 12, 2011 at 9:50 PM · I found when I was growing up, that it was best to start out on something a little more tame and work your way up. I never liked the falling sensation from going down a hill, but after riding some coasters that had smaller hills I built enough of a tolerence up that I could enjoy the coasters with bigger hills. I still will not get on a hyper or mega or whatever else giant (over 200 ft.) drop coasters they make now though. I have had some bad experiences with getting too confident in what you can handle and getting on something that caught me off guard and scared me. The old Free Fall at Six Flags over Goergia was one of the scarest things I have ever done. Rode it once, and never wanted to do that again. January 12, 2011 at 2:34 PM · I'm afraid of heights. The lift hill scares me, and going down the first hill is nerve wracking, but I'm always fine after that. It's easier for me to give up control and accept whatever the ride can dish out. January 12, 2011 at 3:50 PM · I found that closing my eyes on a ride worked best. Once I'd ridden a few times with my eyes closed then I could enjoy the ride with them open. January 12, 2011 at 4:03 PM · The thought of that picture of me screaming bloody murder in a flailing position gets me through those drops. It's my prize. January 12, 2011 at 4:12 PM · Now I really want to go to Disneyland and ride Big Thunder Mountain so I can try the "Goat Trick"! January 12, 2011 at 4:35 PM · Coasters really don't bother me, except for the occasional nausea (hello Alpengeist). Anybody got any tips for drop towers? They move so slow and go so high, I don't think I'll ever get on one. January 12, 2011 at 4:50 PM · After riding nearly 500 coasters, and suffering: anxiety; epilepsy; sciatic rupture ... And, I'm afraid of heights, ... I have some pointers. 1) If you are afraid of heights, start will smaller, steel coasters. Most are smoother than the "woodies" (Tho, older steel coasters can have very jarring moments due to settling tracks and lack of maintenance - look for rust!!) Also, for the higher coasters (above 150'), suspended coasters are the way to go, as the track above your head gives the sensation of being "cradled." I have never felt anxiety on any of this type of ride. 2) NEVER ride a coaster if you are "pressured" to do so. Talk to the one that is pressuring you, and try to understand/overcome your fears. Your friend may know what you don't like about excitement, and the ride may be more tame than it appears. A solid discussion will alleviate most anxieties. 3) BREATH! ... Going up the lift hill can be very frustrating. If you have the feeling you are about to go into shock, breath deeply and swallow hard. Believe me, the ride down is far less troublesome than the ride up! Look around at your surroundings; try to see if you can see your house or hotel!! 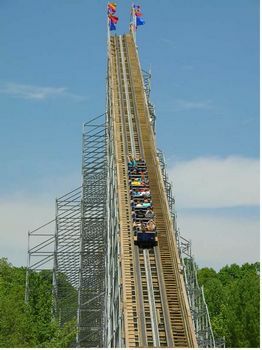 (If you are ridiculously afraid of heights, don't get on a coaster more than 200 feet on a two-seater ... i.e. Superman, Titan, etc ... Try your first mega-coaster with a four-seat spread, and sit in one of the middle two). 4) Once you get over your anxiety (after the third or fourth ride), DO NOT GET COCKY!!! Obey all the rules established! A rollercoaster is NOT a skateboard, or stunt bike, where you need to "up the fright factor" ... If you've become "comfortable" with a ride, seek out a more thrilling sensation on a BIGGER attraction. I've done everything including: standing up; riding backwards; and, once, I even climbed out of shoulder harness and sat on the restraint and rode the coaster with my arms flapping like a bird! (I was kicked out of the park ... obviously). 5) As Robert pointed out: coaster riding is the safest form of transportation on the planet!! Don't feel silly if you have to start with a "kiddie coaster." Some, like the Scooby-Doo, can be fun if you are on it with friends, and you joke around afterwards how silly it all was before you all went on!! January 12, 2011 at 4:55 PM · When I decided to ride the Mummy at Universal, I was very nervous before the ride, but I was smiling after the ride. January 12, 2011 at 8:33 PM · I would say research the coaster before you get on it. Find out what the restraints are (does it have a seatbelt and harness) and knowing that it is safe might make you feel more comfortable. I was scared of heights as a kid (still am) and never rode coasters. I also was never made aware that most coasters have a restraint and safety belt. I think besides knowing what you are doing before you do it is to also just do it. A couple of years ago my wife and I were debating on going to Busch Gardens europe. We almost didn't go because our fear of heights but for some reason I wanted to go. We went straight to Apollo's Chariot and I was nervous as heck but we just didn't hesitate and went right for it. After that ride we rode again and then went on to the next coaster. With each ride the anxiety went away and it became easier. This past year we rode around 40 coasters including Kingda Ka and Intimidator 305 and I have to say I am pretty relaxed and feel safe on any coaster. I think the key is just face your fear and the more you do anything the more comfortable it will become. And also just know they are super safe. January 12, 2011 at 11:29 PM · The first time I rode a roller coaster (Talon, Dorney Park), I was thirteen and really afraid of heights; I rode because I did not want to seem like a coward to my friends. I never had so much fun in my life. A year later, I would ride El Toro and Kingda Ka. What my point is, I never thought I'd like roller coasters or even ride one, but I decided to ride one any way and it was amazing. I think, frankly, those who choose not to ride roller coasters are missing out on the only safe way to have a true adrenaline rush; they're missing out on life. So, maybe I only rode a roller coaster because my dignity was at stake, but it is a choice I'd never regret. January 13, 2011 at 12:13 PM · Before a day of coastering, I take a Dramamine. It works. As i get older, mid 50's, the HORROR, I have to be selective on which coasters I go on. No more Top Thrill Dragsters(0-70 is OK as in Rock N Rollercoaster),rattlely Woodies, or Helex's. Especially backwards ones(can we say Expedition Everest)Losing too many brain cells. But give me a 400+ ft drop anyday. January 14, 2011 at 7:40 AM · You must also PUT YOUR HEAD BACK against the head rest during the ride!!!! If it is your first time on a roller coaster, your natural instinct is pull forward, no idea why, but I saw everyone of our children do it on their first big coaster. Then complain that it made their head hurt. What I realized is that I had learned to make sure my head was back against the headrest of the coaster. So when we go to parks and we have friends with us that haven't been, I always tell them just before we go down or get launched to get their heads back. I even had one adult thank me when he got off the ride that was sitting in front of me who mentioned he never thought of that. By having the head back, it prevents your head from rattling nearly as much, especially if you are in a coaster with shoulder harnesses. Next is, if it is your first coaster, don't choose a wooden one, especially if you are a girl. You will be so sore. The only exception I have found is the Cyclone at Six Flags over Georgia. We love Towers of Terror at Hollywood Studios as each ride has been different. Mentally, I just totally relax. I try to feel like the biggest pile of mush I can. When I do that it is a great ride and my body just absorbs the ups/downs. Now, there have been a few times I have tensed up and really regretted it. I felt like I was a cartoon character that kept getting squished. "Light as a feather" just relax. I can't stress that enough. Oh, lastly, empty your pockets before you get on. Our family has been hit by change, packets of gum and even a camera.